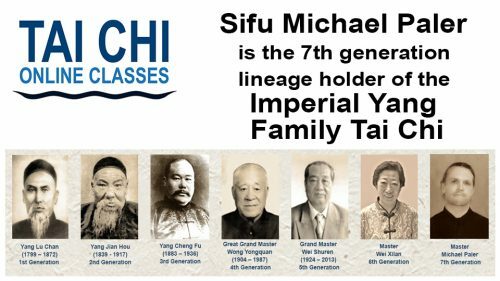 Yang Family Tai Chi movements and principles to create more balance and stability for everyday use. Building and cultivating Zhong Ding “Central Equilibrium” in both the mind and the body is necessary to progress beyond beginner levels of Yang Family Tai Chi. Balance is not something everyone is born with; it’s a discipline we attain through practice. Stress, tension, and gravity steal our balance as we age, but with the right information and tools put to use, we can turn that around. Cultivating Central Equilibrium and other basic principles in Yang Tai Chi opens the door for other more intermediate and advanced Yang Family Tai Chi practices such as creating the left and right channels, sinking the qi, raising the shen, pulling silk, and Fa Jin, among several others. Using these essential principles in our forms, we will begin to build the Tai Chi body from the inside out — creating the springy elastic body state (Peng Jin) of Yang Family Tai Chi and increasing balance among other benefits Tai Chi. Another benefit explained in this first video is the ability to manually flush the lymph system. Using targeted movements and making use of the groin (Kua), armpit, and back of the knees, we begin to see another one of the extraordinary health benefits that these brilliant Yang Tai Chi movements create in the body — gently flushing the three largest clusters of lymph nodes and providing a huge boost to the body’s immune system. As you will see in our video series “Tai Chi for Better Balance” these are just a few of the many health benefits that come from doing Yang Family Tai Chi Chuan. This Tai Chi for Better Balance series was created and is taught by Sifu Michael Paler, founder and Master Instructor of the Tai Chi Association of Colorado Springs, CO. Very nicely presented. Thank you.